Grade 1 winner You Drive I Fly will begin his stallion career at Louisiana Center for Equine Reproduction in Opelousas in 2019. OPELOUSAS, LA—AUGUST 11, 2018—Louisiana Center for Equine Reproduction announced today they will stand LQHBA Louisiana Million Futurity(RG1) winner You Drive I Fly in 2019. His fee has been set at $2,000 with consideration. Trained by AQHA Racing Champion trainer Kenneth Roberts, Sr. and campaigned by his breeders Richard and Janelle Simon of Zachary, Louisiana, You Drive I Fly is the leading money earner of multiple stakes sire Jet Black Patriot and was the leading money earning 2-year-old colt in the nation in 2017. "We are excited to have the opportunity to stand You Drive I Fly," said Stephen Deville, Breeding Manager for LACER. "He's a great-looking horse who's proven to be talented, and consistent and he's from a proven sire-line family. 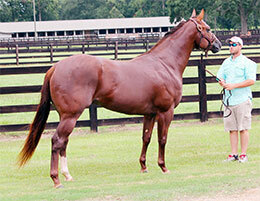 He's a complete stallion prospect and makes a great addition to our roster." 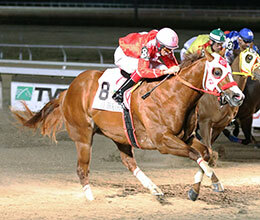 As a 2-year-old, You Drive I Fly won four of five career starts including the $1 million LQHBA Louisiana Million Futurity at Evangeline Downs. Prior to the Louisiana Million victory, he finished second in his only loss in the $705,495 Lee Berwick Futurity(RG1) after getting bumped at the start. He has earned $590,134. "He was a good, solid, honest horse. Gave you 110% effort every time," Roberts said. "He was such an easy going horse to deal with mentally, and such a big and impressive looking horse physically. 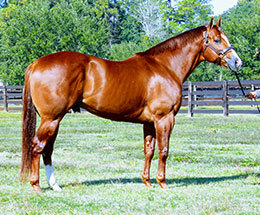 Just a true classy horse with tons of potential pointing towards his new career as a stallion." Following a successful surgery to remove chips from one knee following his 2-year-old campaign, You Drive I Fly's connections made the decision to retire him and not risk hurting him by pushing to get him ready to compete at 3. A $30,000 repurchase in the 2016 LQHBA Yearling Sale, You Drive I Fly was bred by Richard and Janelle Simon from Shakemupperry, an unraced daughter of leading sire Mr Jess Perry. She is the dam of 3 ROM winners from three starters including restricted Grade 1 winner You Drive I Fly SI 98 (see above), Madame Bijoux SI 95 ($49,980), etc. The second dam is the stakes-producing First Down Dash mare Shake Em Dash, a half-sister to AQHA Racing Champion 2-year-old filly Shake The Bank SI 105 ($372,585) and Grade 1 winner and multiple stakes sire Royal Shake Em SI 103 ($257,009). 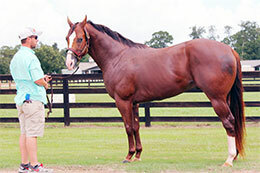 The third dam, Sake Em Six, a half-sister to Dash For Cash Futurity(G1) winner Special Shake SI 103 ($478,645) by Streakin Six was the 1996 Broodmare of the Year. This is the family of stakes winner SF Royal Bank SI 100 ($359,327), Jumpn Shake SI 112 ($182,299), etc. You Drive I Fly will stand his first season at stud in 2019. Richard and Janell Simon also bred and raced You Drive I Fly's sire multiple Grade 1 winner Jet Black Patriot SI 110 ($876,921). From seven crops to race the son of Game Patriot has sired 233 winners, 46 stakes horses(12%), earners in excess of $11 million with average earnings per starter of more than $28,600. A leading sire, Jet Black Patriot sold in the 2017 Heritage Place Fall Mixed Sale for $725,000. For additional information or breeding contracts contact Stephen Deville at 225-202-2104 or 337-407-0708.